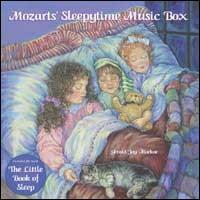 Designed especially to help children fall asleep, this CD is a collection of Wolfgang "Amadeus" Mozart's most beautiful slow music, played on bells, music box and celeste. Kids are irresistibly attracted to bell sounds such as: a music box, sleigh bells, toys with bells, the ice cream man's bell, wind-chimes, pretty doorbells etc. Their attention is drawn and held by the bell sounds playing Mozart's most beautiful slow music. This relaxing music will then lull them into a peaceful, sleep. Included with the CD is The Little Book of Sleep, a compilation of 54 natural ways to help your child fall asleep. It describes methods to induce sleep through: a) any of the 5 senses: sight, touch, smell, hearing and taste; and b) any of the 4 main centers of energy, physical, emotional, mental and spiritual. This Final Clearance item will have a small hole punch in barcode - required by the manufacturer for all of it's clearance products. Different things work for different children and there is something here for everyone.